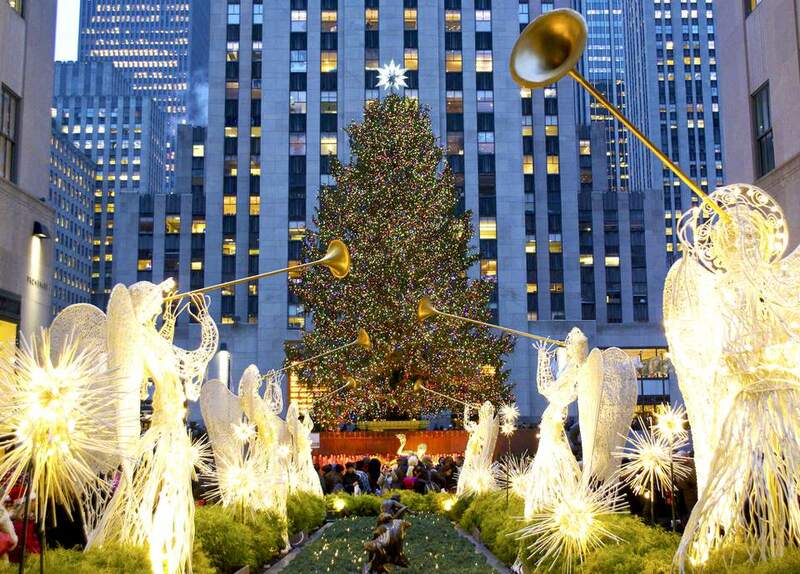 The holiday season is one of the most exciting times to visit New York City and definitely a time popular with families. Beginning in late November, the Big Apple is transformed into a festive holiday destination, from the Christmas tree in Rockefeller Center and the beautifully decorated storefronts along Fifth Avenue to the neighborhood Christmas light displays in Dyker Heights, Brooklyn. Here's a lineup of don't-miss events and activities in NYC happening during the holiday season. It's highly recommended to book your hotel and attraction tickets months in advance. New York City holiday events include such mainstays as the Radio City Music Hall show and the tree-lighting in Rockefeller Center. There are also some lesser-known events which will leave you with some fond memories of your NYC holiday vacation. This New York City musical tradition takes place in the iconic Radio City Music Hall and features the high-kicking Rockettes. The show combines such classic scenes as "Parade of the Wooden Soldiers" and "New York at Christmas" with new numbers and cutting-edge digital projection which transforms Radio City Music Hall's interior into a giant canvas. Advance booking is highly recommended. This year's show takes place November 17, 2018 to January 1, 2019. The New York Botanical Garden’s Holiday Train Show is an ideal family outing featuring model trains that zip through replicas of New York City landmarks made of plants. The Statue of Liberty, the Brooklyn Bridge, and Yankee Stadium are among the 150 landmarks that form the cityscape built from seeds, bark, leaves, and twigs. The trains run on a half-mile of track through the historic Enid A. Haupt Conservatory. This year's train show showcases Lower Manhattan’s famous skyscrapers with replicas of the Woolworth Building and One World Trade Center, and for added fun, some vintage ferry boat replicas. Go for the trains but stay for the scheduled musical performances. The event takes place November 17, 2018 to January 21, 2019. This is a holiday bus tour to remember. Families can view New York City’s holiday festivities and cheer through floor-to-ceiling windows from the comfort of a multi-million dollar motor coach. The experience is hosted by two on-board New York City experts and features live street performers. This year's rides can be taken November 15, 2018 to January 6, 2019. The famous Origami Holiday Tree at the American Museum of Natural History is a staple of the holiday season. This year's theme is "Oceans of Origami," with models inspired by the special exhibition Unseen Oceans. The tree is decorated with more than 800 hand-folded paper models created by local, national, and international origami artists. You can get in the act too. Volunteers will be on hand to teach Origami paper folding. The event takes place November 19, 2018, through January 13, 2019. This televised tradition kicks off at 9 a.m. on Thanksgiving Day but families can also attend a fun event on the afternoon before, to watch the famously oversized helium balloons getting inflated on the Upper West Side. Then on Thanksgiving Day, grab a good viewing spot to see the procession of fantasy-filled floats, marching bands, performance groups, and clowns. Opening November 23, 2018, one of the season’s favorite annual productions, George Balanchine’s The Nutcracker is a holiday feast complete with marching toy soldiers, a one-ton Christmas tree that grows before the audience’s eyes and crystalline snowflakes. This is a special event with all 90 dancers, 62 musicians, 40 stagehands, and more than 125 children, in two alternating casts, from the School of American Ballet joining forces to make each performance as magical as possible. The iconic tree on Rockefeller Plaza will be lit for the first time on November 28, 2018, with live performances from 7 to 9 p.m. Tens of thousands crowd the sidewalks, and millions will watch it live on TV. The tree will remain lit until 9 p.m. on January 7, 2019. Now in its eighth year, this holiday bus tour offers families the opportunity to see the famed Dyker Heights Christmas lights. Every year the neighborhood is ablaze with illuminating exhibitions complete with 30-foot toy soldiers and nativity scenes. The bus also offers festive holiday music and old-time Christmas television variety specials, topped off with a taste of Brooklyn’s best cannolis and hot chocolate. It's a 3.5-hour tour and takes place every night in December except Christmas Eve and Christmas Day. This kids' favorite will be performed at the Hulu Theater at Madison Square Garden. Enjoy Dr. Seuss' classic holiday tale as it comes to life on stage. Featuring the hit songs "You're a Mean One, Mr. Grinch" and "Welcome Home, Christmas," The Grinch finds out that there's more to Christmas than he expected. Shows take place December 13, 2018 to December 30, 2018. On Dec. 1, 2018, you can get your holiday shopping done during this annual philanthropic shopping event. Retailers and businesses located on Madison Avenue between 57th and 86th streets will donate 20 percent of sales that day to The Society of Memorial Sloan Kettering Cancer Center. On the Avenue, you’ll meet MSK’s beloved therapy dogs, the Caring Canines, and costumed carolers will be strolling up and down Madison Avenue. On Dec. 8 and 15, 2018, this historic community on Staten Island will hold its annual holiday favorite candlelight tour. Candles, oil lamps, and flickering fireplaces light up the town, and families can attend a “wassail bowl” reception in the Courthouse. Prepaid reservations are required. After families tour the decorated Adriance farmhouse in Floral Park, Queens, children can join in a crafts activity while everyone enjoys a cup of freshly mulled cider. Open 12 noon to 4 p.m. on Dec. 26 – 28, 2018. Free. Families brave enough to face the crowds can attend one of the world’s most spectacular New Year's Eve celebrations in Times Square. The annual ball drop attracts an estimated million people each year, with over a billion additional viewers watching from around the globe.